Idling the engine more than necessary the driver, especially while driving on city roads with lots of traffic lights and pedestrian crossings. The inability to not turn off the car during periods of short-term stops, greatly hinder movement. The disruption of the idle stroke may occur due to a malfunction of the special sensorresponsible for this function. In case of failure it must be quickly replaced. Set your machine on a flat surface. Put the car on the Parking brake. After all the preparations, open the hood and locate the idle air control speed. 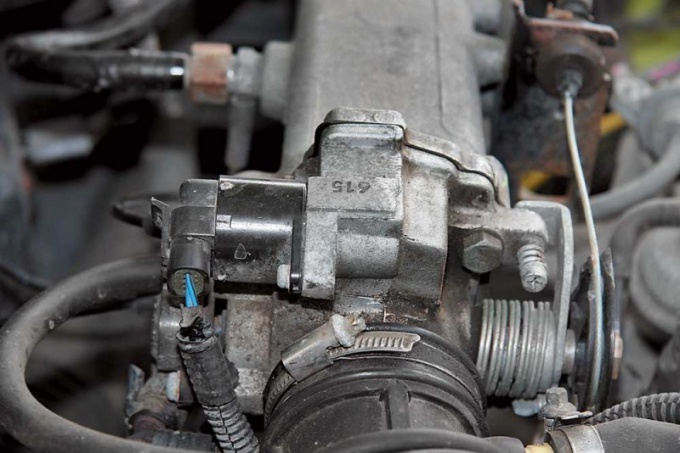 In most cars it is located on the throttle body (you can detect it by pressing pedal gas). Battery disconnect terminal with a negative charge, it will prevent a short in the power to the motor. Remove the throttle unit, to simplify the change of sensor idle speed. The controller is attached with three bolts. They should remove the Phillips screwdriver to the side of the throttle node. Be careful, as some car models, one of the screws can simultaneously fasten the bracket for the harness. Then carefully remove the controller from the throttle. Before installing new sensor , clean the air channel a throttle site, and the surface for installing the o-rings from contamination. Carefully inspect the gasket, if it cracks, scuffs or signs of wear, it must be replaced. Before installing the o-ring should be thoroughly lubricated with engine oil. The throttle hole of the node, apply the o-ring. Until it stops then insert a new sensor idle speed. Now tighten the fixing screws. Don't forget to secure the wiring harness bracket. Screw in place of the throttle unit. Check the correctness and tightness of all sections of mount. Now put the terminal with a negative charge on the battery and try to start the engine. A few minutes after starting the car the engine can run at a high speed compared to conventional indicators. However, after some time everything will work out. Thus the machine responds to the installation of a new idle sensor. Before installing a new sensor will compare its size with the old one. Measure the distance between the connecting flange and the tip of the needle. The result should be the same on both controllers, otherwise the installation will fail.